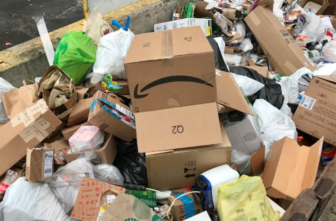 Single stream recycling simplifies how recycling is done by allowing paper, cardboard, plastic, metal & glass to be “co-mingled,” or in one bin. 4) PLASTIC BAGS should be BUNCHED TOGETHER inside another bag – never loose. These simple steps facilitate operations at the sorting facility, and ensure that the materials you’ve made the effort to recycle are actually recycled! — This is an announcement from the Darien Recycling Center on Facebook. Like that page on Facebook and you can get your tips directly, as soon as they come out, and keep informed on other recycling information. Find out more about recycling in Darien here. If you want to give your old hose a bit more life before tossing, consider these reuse ideas. Unusable garden hoses, like this one, should be thrown in the trash. They "catch" in equipment at the sorting facility, and should never be placed in single stream. Here are some tips for donating items to the Swap Shop at the Darien Recycling Center/Transfer Station. "The posted rules are simple: no smoking, no pets, no children under the age of one.